In addition to sponsoring the event, Barbour International will also collaborate on a custom motorcycle build with the innovative bike collective Spirit of the Seventies, to continue their support for the emerging UK custom bike scene. 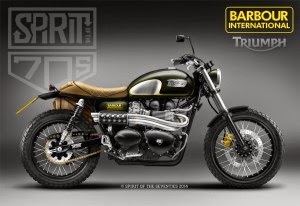 Barbour International, with help from Triumph Motorcycles in the donation of a Bonneville Scrambler, has tasked young UK builders Spirit of the Seventies to embody the Barbour International identity in a one-off unique bike. With input from Barbour International menswear designer, Gary Janes, Spirit of the Seventies British duo Tim Rogers and Kevin Taggart have been tasked to build a one-off bike that embodies the brand’s identity.